Today's Groovy Flashback is in honor of the 42nd Annual Daytime Emmy Awards. 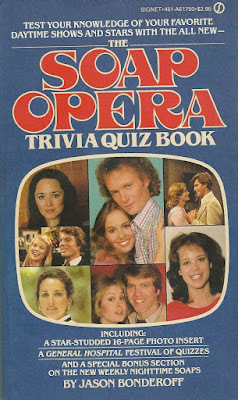 I bought The Soap Opera Trivia Quiz Book when it was first published in August 1982, and below are three of its 201 quizzes to "test your soap opera IQ" (You can find the answers after the jump). What serials introduced these acutely tragic romantic triangles? The greatest soap opera love stories live on forever, long after the characters have been written off and the actors have switched allegiance to other shows. 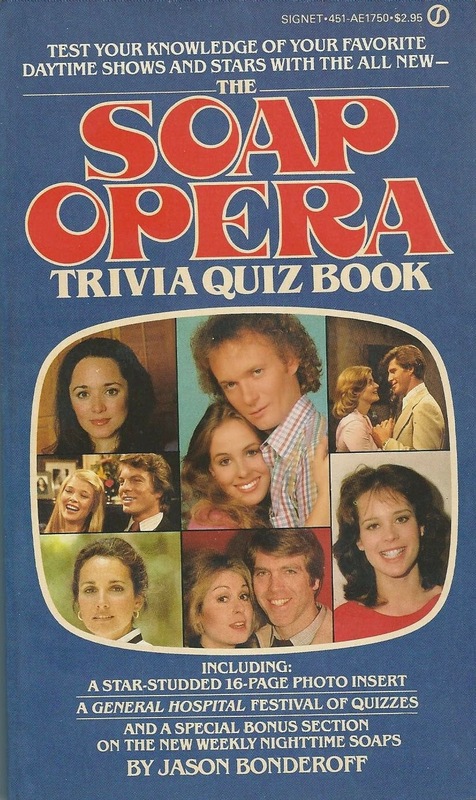 Can you identify the soaps that introduced these immortal couples? On what soaps did these cliff-hanging situations occur? 1. Kim rushed into the cave just in time. She stopped Nick before he could strangle Steve. "Oh my God, I almost killed my brother," he wept. 2. Lee tore through the jungle brush, searching frantically for Sunny. "I have to save her from Dr. Kyle before it's too late!" he thought over and over again. 3. Ross rushed into Carrie's room. She was lying there unconscious. Suddenly, he saw the empty bottle of pills. "Please, please, don't die!" he whispered. 4. Marlena saw the strangled doll and shrieked. She was all alone, even the police couldn't help her now. "Am I the next victim?" she wondered helplessly. 5. Chuck and Donna were trapped on the mountain slope, certain they'd never be rescued alive. Donna looked at Chuck and thought, "Did I ever really stop loving him?" 7. Palmer stormed into the room. "Daisy, how dare you lie to me!" he raged. "You never had an operation! You're my wife—and I demand my rights!" 8. Unexpectedly, Alan returned to the island to confront Mike. "I'm ready to stand trial for my crime," he said. "I was Roger's conspirator." 9. On the balcony, Samantha and Olympia struggled for the gun. "I'll never go to a rest home—never!" Olympia cried out just before she fell over the railing. 10. On Victoria Peak, Sylvie was holding Liza hostage. She was about to shoot when Zach stepped between them. The shot rang out. "I'm sorry, Liza, I'm sorry," he moaned, falling to the ground. 11. In the middle of the birthday party, the phone rang. It was Nola. "Oh, Kelly!" she whimpered. "Come quickly, I think I'm having a miscarriage!" 12. Racing frantically against time, Luke punched out letter after letter on the computer board. "I've got it!" he cried at last. "The code words are Ice Princess!"